Hotel Thrillist Phoenix was one of the highlights of my summer. Good food, tantalizing cocktails and great company made for a perfect weekend. 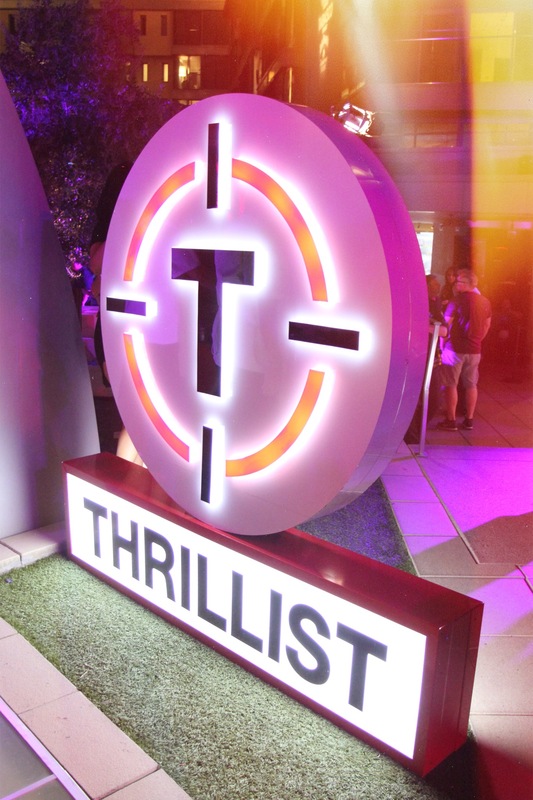 Thrillist had everything on point, from the music and the vibe, to the entertainment (mermaids in the pool, drones potentially crashing into things, custom decor, etc.). It is actually difficult to sum it up in words because it was just that fun, but I will do my best. For one night, 16 amazing local restaurants came together on the rooftop of the W Scottsdale to serve up some of their best dishes, including some special off-menu items. The W Wet Deck bars mixed Jack Fire with magic to make a sweet tea cocktail that tasted like autumn in a glass, even though the weekend made it feel like summer would never end in Arizona. In my opinion the two winning restaurants were Gadzooks and Sumo Maya – not that it was a competition, but Gadzooks served a ridiculous taco. Starting with handmade half corn/half flour tortillas, they piled on tomatillo roasted chicken, sweet slaw, spicy-sweet cornbread, and drizzled creamy flavor-packed sauces on top and I just couldn’t tear myself away. But luckily I saved some room because we made it to Sumo Maya’s booth near the end of our evening, and OH man, maybe I’m just a sucker for sushi, but I couldn’t get enough. It didn’t hurt that there were flower petals on top. Some of my other favorites included Diego Pop’s, Tabasco’s chocolate fountain (!!! ), Lolo’s Chicken and Waffles, and Snooze Eatery. For some reason I thought the good eats were reserved for Friday night only, but I was wrong. The chefs for the Hotel Thrillist Pool Party seriously delivered, serving up roasted pork bahn mi, boozy shaved ice, a DIY taco bar, sweet corn and crab bites – and – Grilled Sea Bass with Citrus Jalapeno Beurre Blanc (recipe below). I was completely enchanted by this grilled sea bass. The grill itself was somehow a cross between a mini smoker and a grill and I now need to figure out how to make one for myself, because this sea bass needs to be a regular thing at my house. I want to cook everything on that grill. It had pieces of wood sending smoke straight up into the fish like grilled heaven, but it was the sauce that completed it; creamy, vibrant, and impossibly silky. You have to taste it to believe it because words do not do it justice. On this day, the W Wet Deck bars mixed even better cocktails which I did not know was possible; I was so not a whiskey person but now I am? and I know I need to keep Jack Fire and Jack Honey on hand so that I can sip Autumn cocktails and (alcoholic) apple pie in a glass whenever I feel like it. These cocktails perfectly set the tone for the beginning of Fall and I’m excited to whip them up come Thanksgiving. Check out the recipes below for an easy Autumn cocktail & grilled Sea Bass. 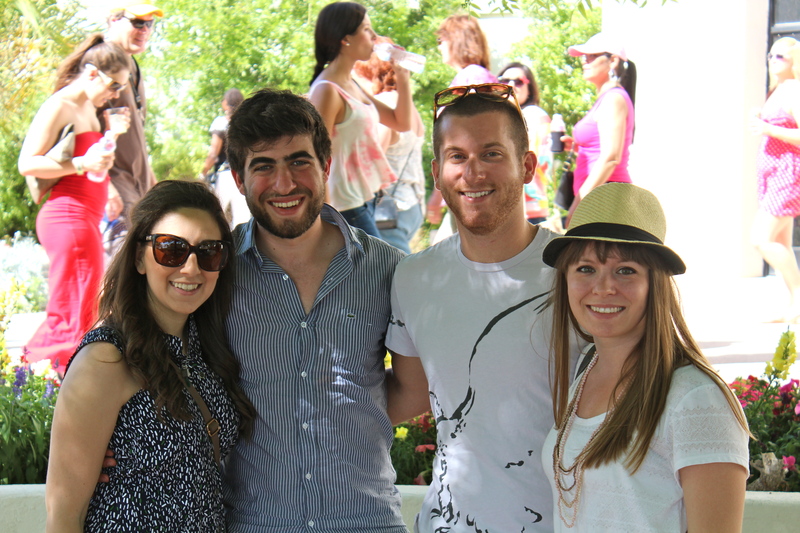 If Hotel Thrillist is featured in your city next year, you can’t miss it! Build ingredients in order in a glass with no ice. Place milk, cream, garlic and Jalapeno together in a sauce pot and bring to a slight simmer. Remove from heat and strain. Add to the strained cream the zest and juice from the three types of citrus and return to the stove and reduce by half. Once reduced, remove from heat and add Greem Jalapeno Tabasco and 4 tbsp butter. Whisk together untill butter is completely melted. Cut fish into 1×1 cubes and place 4 pieces on a skewer. Generously coat skewers with Beurre Blanc sauce and top with chopped cilantro and/or micro greens. 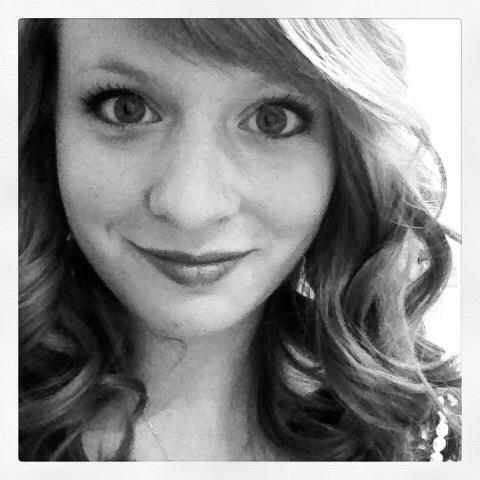 This past Saturday was quite eventful as far as culinary experiences are concerned. 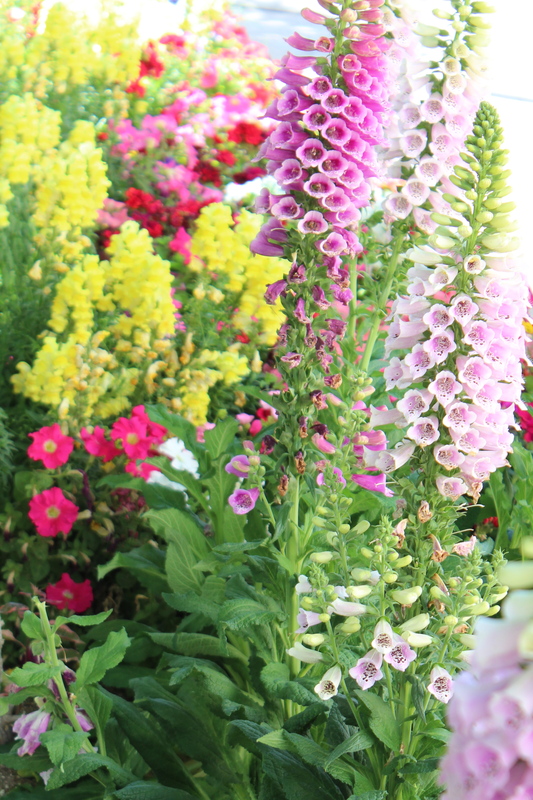 April seems to be the most popular month for festivals of all kinds in Phoenix, maybe because the weather is beautiful and sunny with the perfect breeze, the flowers are blooming and the mountains are bursting with greenery. April is the month when Arizona comes alive and everyone craves the outdoors. This past Saturday was no different; hundreds of people attended both the Phoenix Gluten Free Expo and the Scottsdale Culinary Festival. I didn’t want to miss either one, so I made them both fit in to my schedule! 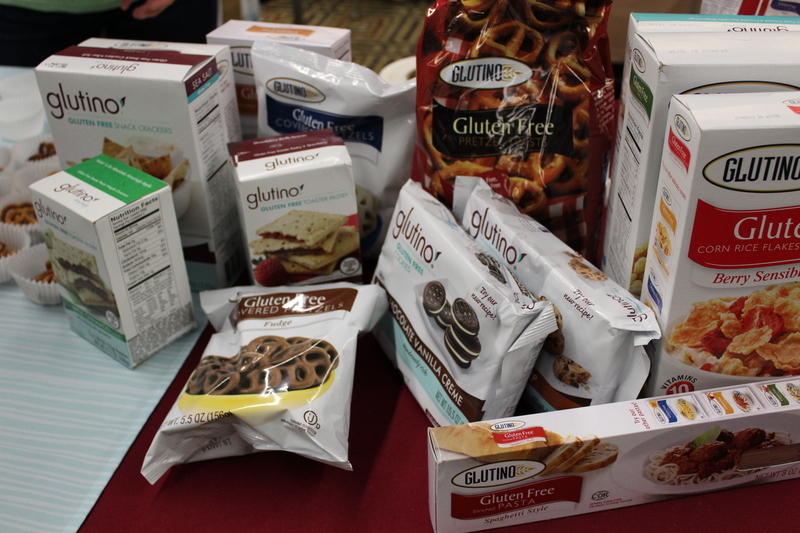 First, I stopped by the Phoenix Gluten Free Expo. 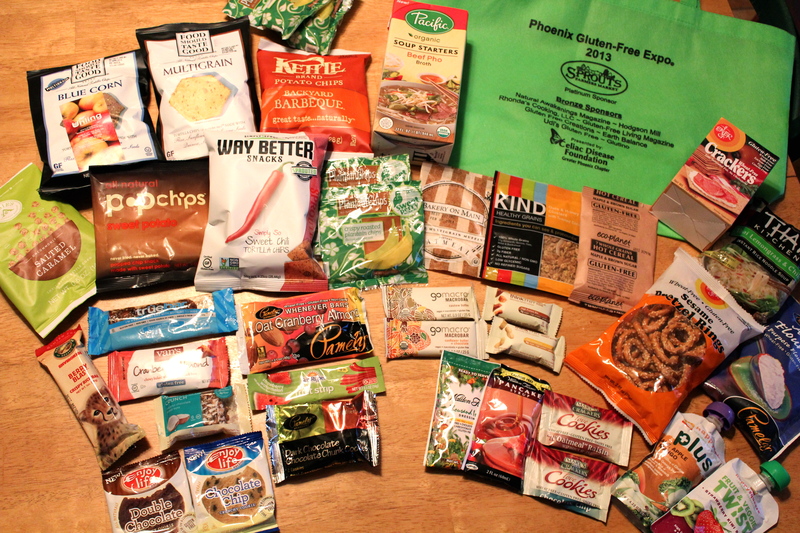 I paid the $10 admission fee and was rewarded with a green reusable bag to fill with coupons, magazines, restaurant menus and tons of samples! My entire bag was full! Sprouts Farmers Market (my favorite grocery store ever) sponsored the event, and the line for their booth was the longest because Sprouts gave away an incredible amount of samples! 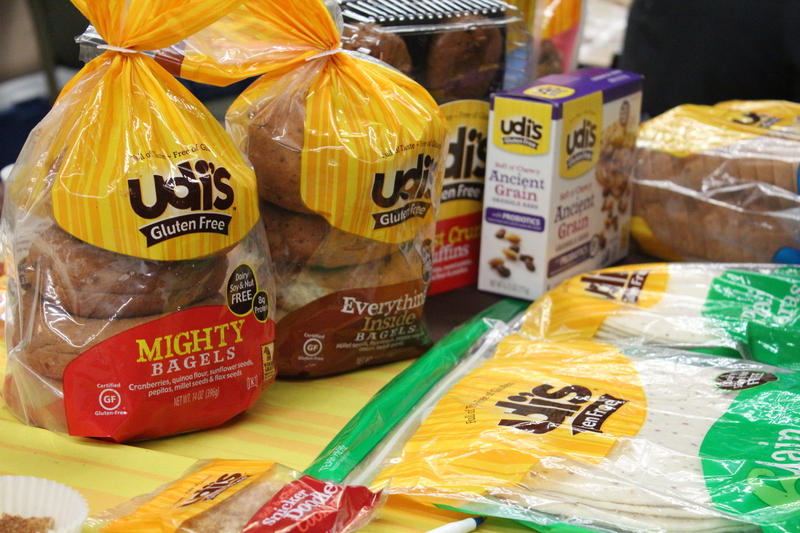 Some other sponsors and booths included popular brands like Udi’s, Glutino, and Van’s, alongside lesser known brands and local restaurants which also offer gluten free options. I’m so excited to use some of my restaurant coupons to discover some new locations in Phoenix and Scottsdale, and my other coupons will come in handy when I want to go buy more of my samples- I’m already in love with Pamela’s Dark Chocolate Chunk Cookies and the thinkThin Crunch Coconut Chocolate bars. Also, if you’re looking for a quick and convenient breakfast fix to keep in your office, check out the Bakery on Main Maple Instant Oatmeal! Holy Yum! 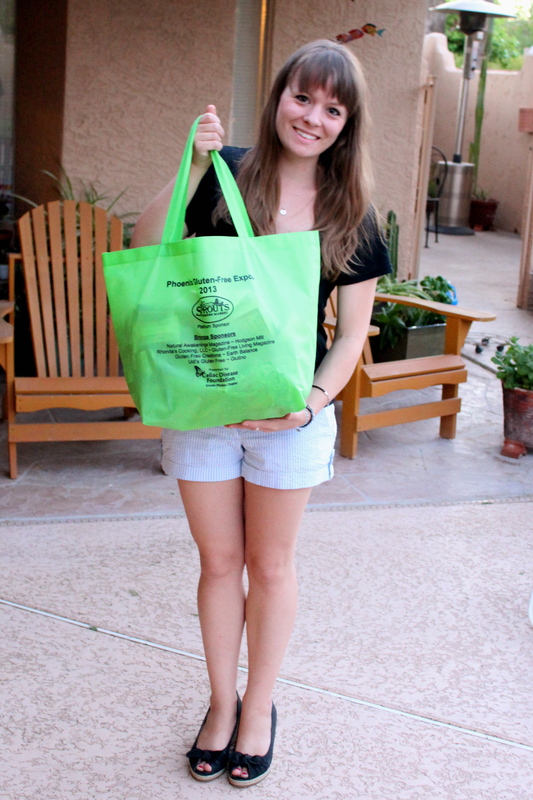 Feeling accomplished with my goldmine of loot from the Phoenix Gluten Free Expo, I hopped in my car to meet with friends and enjoy the beautiful weather and delicious food at the Scottsdale Culinary Festival’s Great Arizona Picnic. 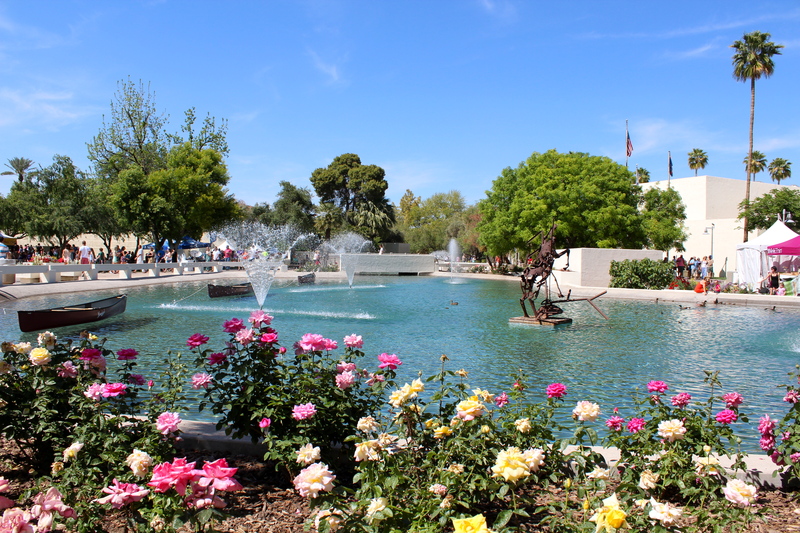 The sun was shining, the birds were chirping and the flowers were astonishingly beautiful at the Scottsdale Civic Center. We had such a blast trying foods from various valley restaurants. 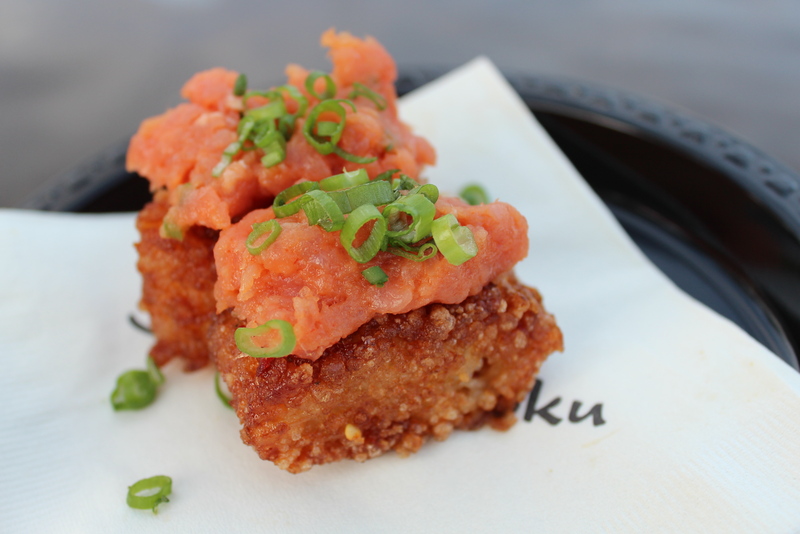 Our favorite was Sushi Roku’s Hanabi (spicy tuna on crispy rice), which won “Best Food” of the festival in 2012. It featured a crispy rice base that had a beautiful, satisfying flavor which is normally lacking in similar dishes. The abundance of flavor was due to a sauce or glaze on the rice that was both sweet and a bit salty, much like an eel sauce. It was topped with incredibly fresh tuna and scallions. The resulting dish was impeccably mouthwatering; the crispy rice reveals a soft interior, coupled with a tantalizing combination of sauce and luscious fresh fish. If we had to choose, they would win best food for 2013 too! I also enjoyed Chicken Tiki Masala from Bombay Spice, Mango Lassi from Jewel of the Crown Cuisine of India, and a delicious shrimp ceviche (but I didn’t catch the restauran’t name). 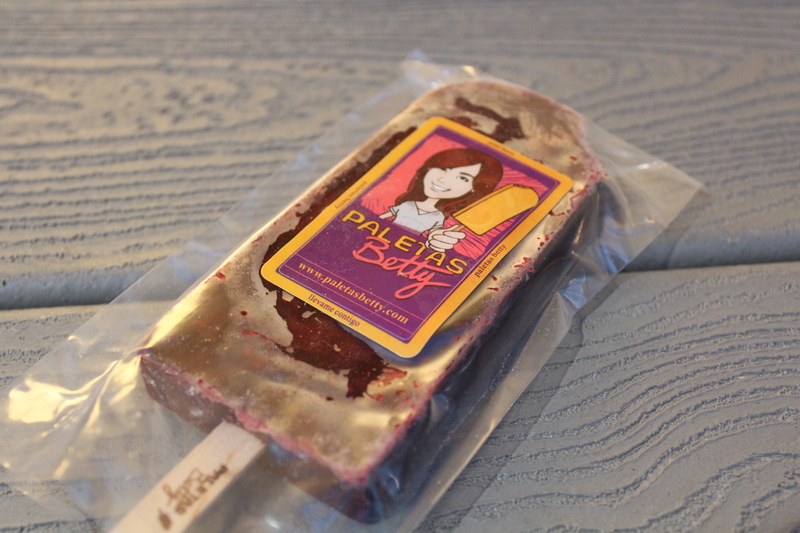 To finish, I indulged in an icy-cool blackberry lavender popsicle from Paleta’s Betty. I’ve written briefly about my adoration for lavender, and this was no different; with sweet floral flavors alongside succulent blackberry chunks, this popsicle was divine. Paleta’s Betty is a must-visit if you are in Tempe. They feature seasonal popsicle (paleta, in Spanish) flavors and combinations that will make your mouth water. You’ll want to try them all! It was a really fun event, complete with live music and dancing. I’m so glad that I had the opportunity to go and enjoy the event with such great company, I’ll be looking forward to the 2014 Scottsdale Culinary Expo! 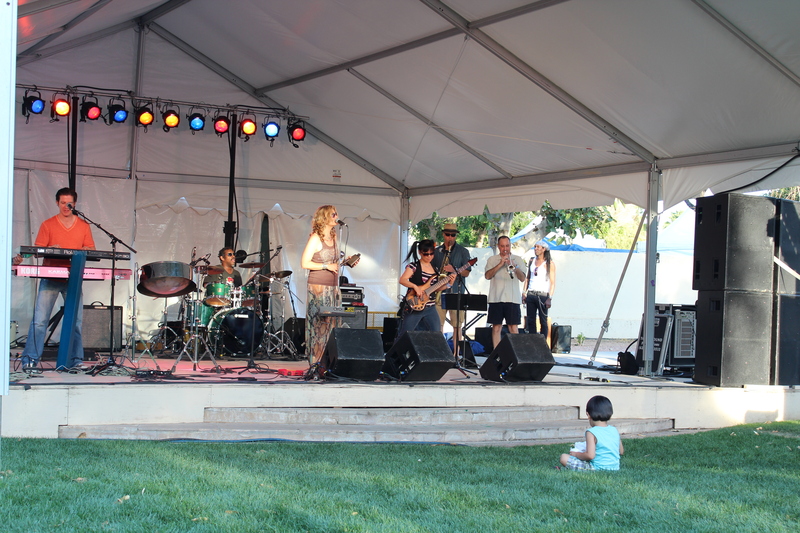 The littlest audience, enjoying Sugahbeat. So cute! Next Saturday: The Arizona BBQ Festival!